Our senses allow us to experience the world we live in, and are one of the key components of consciousness. In fact, our senses are so important that whole industries have been built upon a single sense. For example, radio is associated with hearing, cooking with taste, fragrance with smell and television with both vision and hearing. As you can see, without our senses the world would be a very different place, as we would not be able to experience all the various things it has to offer. If we were not able to experience things then learning would also become impossible, since in order for us to learn something we must first be capable of experiencing it. Each of our five senses allow us to experience and interact with the world. This is why the study of our senses, or sensation, is considered to be such an important area of psychology, because it is one of the key components that makes consciousness possible. Below you will find a description of each of the five senses. Life would be very different if you were unable to see. Most people consider vision to be their primary sense, as virtually everything we do involves the use of vision. However, in order to understand vision, we first need to look at the stimulus that make it possible: light. Light consists of a set of electromagnetic waves which travel at a speed of around 186,000 miles per second. Electromagnetic waves, as the name suggests, are made up of electrical and magnetic fields that possess the ability to travel through a vacuum (i.e., a space completely devoid of matter that contains no air or gas). This is why it’s possible for Earth to communicate with astronauts in space, as radio waves are one kind of electromagnetic wave. 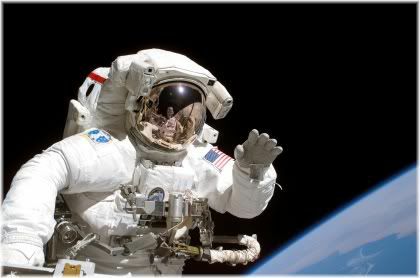 Electromagnetic waves enable us to communicate with astronauts in space. The waves we call “light” exist within a relatively narrow band of the electromagnetic spectrum. This spectrum ranges from long radio waves at one end, to short gamma rays at the other end. Light waves are found in between these two extremes, and are said to have a length of 750-400 nanometres. 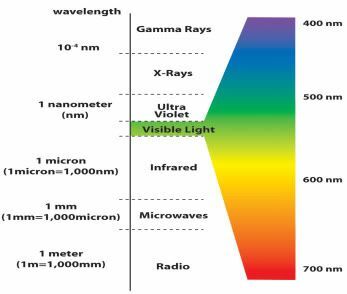 The part of the electromagnetic spectrum that we can see is called the visible spectrum, and starting at 750 nanometres, consists of the colors red, orange, yellow, green, blue, indigo and violet. These are the same colors that appear in a rainbow and are always found in the same order. We can only see a small spectrum of light with the naked eye. Waves that are longer than 750 nanometres are called infra-red rays, and waves which are shorter than 400 nanometres are called ultra-violet rays. Both of which we cannot see. Although light is necessary for vision, in order for us to see something we need to be able to convert light into useable information. 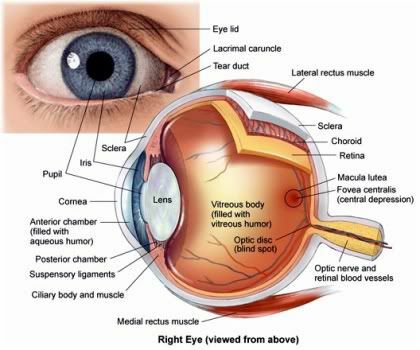 This is done through our sensory organ, the eye. In front of the eye is the cornea, which, due to its convex shape, bends light waves and makes them converge on the lens. The lens then focuses these light waves and produces an inverted (upside down) image on the retina. The retina contains a series of light-sensitive neurons called photoreceptor’s. You don’t really see with your eyes, you see with your brain as a result of it processing the visual input that it receives. In the center of the retina is the fovea, which determines how well we can see something (visual acuity) and the color of what we see (color vision). The outer periphery of the retina plays a role in detecting light signals and the brightness of what we see. 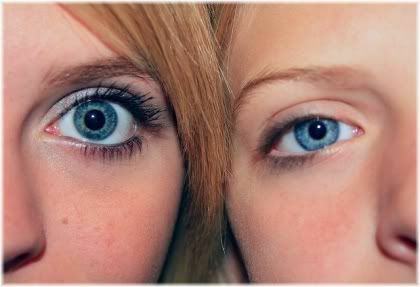 There are two kinds of photoreceptor’s in the retina. The first are called cones which are mainly found in the fovea, and the second are called rods which are mainly found along the outer periphery. One of the leading theories of how we see things in color (color vision) is the Trichromatic theory. This theory hypothesizes that we have three kinds of cones in the eye that are differentially sensitive to three wavelengths of light: 750 nanometres, 500 nanometres and 450 nanometres. In turn, each of these wavelengths gives us the sensation of a color. The first wavelength of 750 nanometres creates the sensation of red, the second wavelength of 500 nanometres creates green, and the third wavelength of 450 nanometres creates blue. It is important to note that this theory does not suggest that color comes from light, but rather that color is produced as a result of the firing of photoreceptors. The Young-Helmholtz trichromatic theory of vision states that there are three types of cones with each being sensitive to a different wavelength of light. To account for the sensation of colors others than red, green and blue, the Trichromatic theory proposes that certain wavelengths of light cause the simultaneous firing of multiple neurons. For example, the sensation of orange occurs because a wavelength of 650 nanometers causes the firing of some neurons which normally fire at 750 nanometres and some neurons which normally fire at 500 nanometres. In other words, other colors are created by activating multiple cones so that their colors are mixed to create another color, similar in principle to how colors are mixed in a paint set. White light, the theory proposes, is created as a result of all the wavelengths arriving at the retina in a random or scrambled fashion which causes all three cones to fire at once. Just like how you can mix different colored paints to produce different colors, the firing of different neurons can result in the sensation of different colors. Whilst the Trichromatic theory is a widely accepted view of how color vision works, it is not perfect. For example, according to the theory people who are red-green blind (color blind) would not be able to see yellow, yet they are able to do so. So whilst the Trichromatic theory may explain at a lot about how we see in color, it does not explain everything. 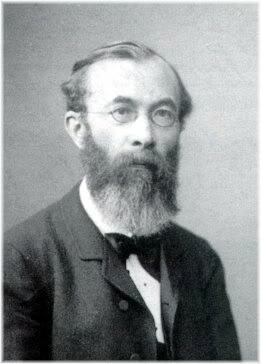 There are three basic sensations of vision as proposed by Wilhelm Wundt. The ability to distinguish colors from each other. To see a range of color. The level of illumination we see in a color, such as white vs. black. How rich a color appears to be. 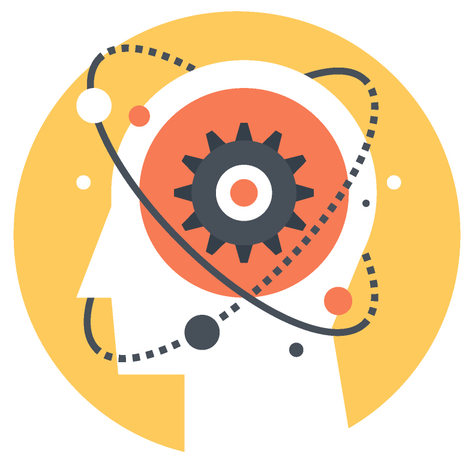 Hearing allows us to gain insight into the minds of others, and so is therefore a very important sense for communicating with others. Hearing is another important sense that allows us to experience the world, as without it, we would live in social isolation. A good example of this occurs when talking to another person. If we were not able to hear what they were saying, our communication with them would be extremely limited. As a result, people who are unable to hear sound (because they are deaf) learn sign language so that they can overcome this isolation caused by their inability to hear sound. Just like vision, the sense of hearing can be better understood by studying the stimulus that makes hearing possible, the sound wave. Sound waves are created from a vibrating source, and require a medium such as air or water to travel in. For example, by plucking a guitar string we cause a wave of vibrations to spread through the air which eventually strike our ear drum enabling us to hear it as a sound. 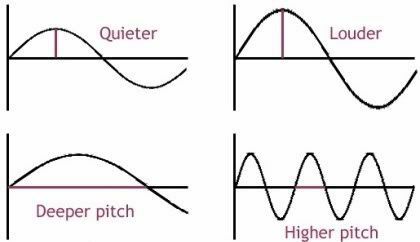 The frequency of a sound wave determines its pitch, whilst the amplitude of a sound wave determines its loudness. The rate of this vibration is called the frequency, and is measured in hertz (Hz). One hertz is equal to one vibration (or cycle) per second, and the more something vibrates (the more cycles per second / the higher the hertz) the higher the pitch we hear will be. The intensity of a sound wave is measured in decibels (dB), whereby the greater the decibel level the louder the sound will be. The ear allows us to experience the sensation of sound. 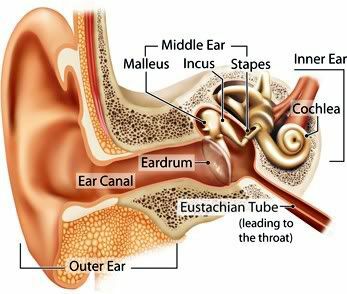 When sound reaches the eardrum (aka the tympanic membrane) it causes it to vibrate. These vibrations are then passed on to a structure known as the oval window. This is made possible by three bones called the Malleus (hammer), the Incus (anvil) and the Stapes (stirrup). Sound waves from the external environment that are received by the ear, are sent to the brain where they are interpreted as patterns of sound. The vibrations in the oval window are passed to the cochlea, which is a fluid filled spiral structure that looks similar to a snail-shell. Inside the cochlea is the basilar membrane, which plays a similar role in hearing as the retina does in vision. Ultimately sound is passed onto the brain via the auditory nerve. 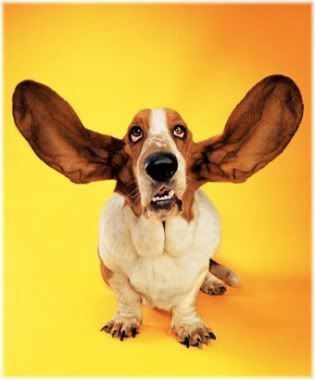 The ability to hear low to high-pitched sounds. How loud a sound is. How rich a sound is. The quality of that sound. Similar to the saturation of color. Taste is made possible by clusters of neurons on the tongue known as taste buds, which are stimulated by various chemical compounds found in food and liquids. In response to these compounds, the taste buds produce four basic taste sensations; sweet, salty, bitter and sour. All four of these taste sensations combine in different combinations to give us the many flavors we experience in foods and drinks. The taste buds are grouped together in specific areas on the tongue. For example, taste buds for sweetness are found near the tip of the tongue. 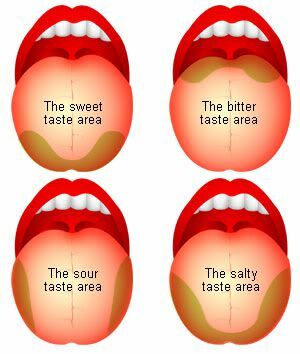 Different areas of the tongue are responsible for producing the four sensations of taste. 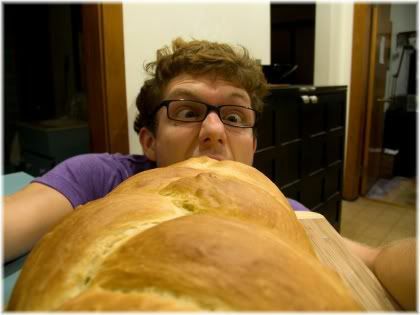 However, what we taste does not come purely as a result of the chemical compounds found within a food, as taste interacts with other senses which then affects how something tastes to us. For example, when you cook dinner, taste can be affected by how the meal is presented, the type of smell it has and also how that food feels once you put it in your mouth. Different types of touch send different messages to the brain. 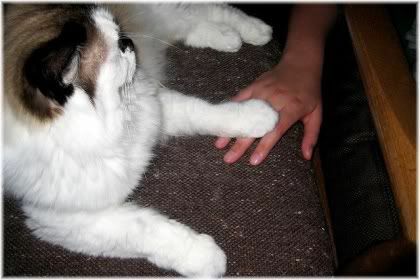 Touch is more accurately defined in terms of a skin sense, of which, there are four different kinds. The first sense is light touch, which we sense when slight or gentle pressure is applied to the skin. For example, lightly stroking the skin. The next sense is deep touch, which we feel when heavy pressure is applied to the skin. For example, a firm handshake. The receptor neurons in our skin can detect changes in temperature. When heat is conducted towards the skin, we feel a localized heat or warmth in that area. For example, putting your hand over a flame. When heat is conducted away from the skin, we feel cold. For example, walking bare feet on the floor. When our skin becomes damaged (such as when it is cut) the neurons in our skin detect this damage and we register it as pain. Smell allows us to detect chemical substances in our environment. 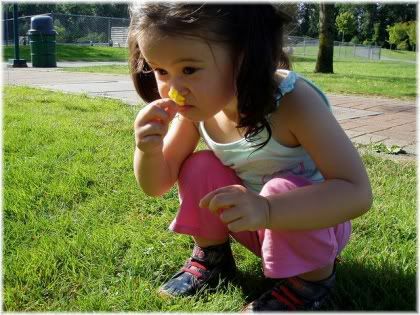 The sense of smell is known as olfaction, and allows us to detect chemical substances in the air via the olfactory epithelium in the nose. Although there is no firmly established number of smell sensations, there are four that are agreed upon. The smell of burning food. Like the smell of cinnamon. Kinasesthesia allows you to know the location of the parts of your body without having to consciously think where they are. The kinaesthetic sense is the ability to know the position of your body, even when your eyes are closed. For example, providing your kinaesthetic sense is working correctly, if you close your eyes you should be able to touch the tip of your nose. This sense therefore allows you to move your body without having to remember where each body part is, such as when you are walking or running. The receptor neurons which make the kinaesthetic sense possible are found in the connective tissue surrounding the body’s joints and also within the joints themselves. 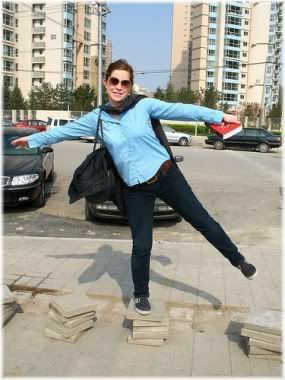 The sense of balance is also known as the vestibular sense. The sense of balance tells you whether you are in an upright position or not. The way the body detects this is by fluid in the semicircular canals in the ears. The movement of the fluid stimulates the firing of receptor neurons, which then tells the brain what sort of position you are in. This sense is also known as the vestibular sense. We may be capable of much more than we think. 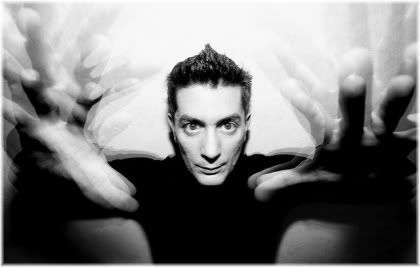 Extrasensory perception is defined as having awareness beyond the normal senses, such as vision or hearing, and is what some people call the “sixth sense”. In reality, however, it would be more accurate to call it the “eight sense”, because in addition to our regular five senses, we also have our kinaesthetic and vestibular sense. There are three main types of extrasensory perception: precognition, telepathy and clairvoyance. Precognition describes ones ability to predict the future, to know the course of future events. One of the most famous examples of a person who is said to have possessed this sense is Nostradamus. Telepathy is the ability to send and receive mental images, or to read the minds of other people. This ability is often attributed to alien beings. Clairvoyance, which means “clear seeing”, is the power to have visions and to see something outside of the range of normal vision. For example, some clairvoyants are said to be able to diagnose disease by looking inside a person’s body, similar to how an x-ray machine can. A person who is able to combine the powers of precognition and clairvoyance (a seer), is thought to be able to both predict and see future events. Psychokinesis is the ability to move objects using only the power of the mind. Although it is not a form of extrasensory perception it is often portrayed as one, especially in comic books and science fiction movies. A well-known example of psychokinesis can be found in the movie “The Empire Strikes Back” when master Yoda lifts Luke Skywalker’s x-wing out of the swamp with his mind. All fours of these powers: precognition, telepathy, clairvoyance and psychokinesis are grouped together as a class of mental abilities called psi powers. Psi powers are defined as mental abilities that go against the conventional laws of physics, and our accepted understanding of science.